It's been about 5 years since I updated this screensaver. I kept the old versions around, in-case someone still wants them. 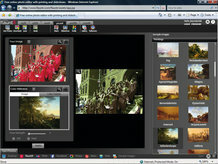 The new version (Version 3), supports any resolution and also supports dual monitors. Although, the newer version doesn't have quite the customized speed options as the old versions had. Sandboxie - have you heard of it? used it? This is mostly for 'geeks' and 'power users'. If you're not very 'geeky', you probably won't be interested in Sandboxie. Sandboxie is a framework that runs your programs in an isolated space (a sandbox), keeping them from making permanent changes to other programs or files. This is an excellent solution to keeping your system safe if you install or test software regularly. This is also great for secure web browsing, enhanced privacy and keeping your Windows environment lean. If you're a developer/programmer, Sandboxie allows you to run your program in a sandbox. No changes are made to your system - that are only made in the sandbox. When you're done, just delete the sandbox. That's it. Your system never knew it existed. All trace gone. If you're concerned about security and privacy, and you're a little 'geeky', you may find this to be a great, must-have tool. Here's a nice collection of 39 wallpapers from great movies. Have fun!